Friday, I posted a tool that I had trouble identifying and asked the readers have a guess at its function. Today, I’ll post all the information I have about the tool. Unfortunately this is the sum total of the information they give — they don’t even supply a picture of the business end of the cylinder. A 14mm / 17mm wrench is pretty common in my work with German equipment. The attachment looks like something for bathroom fittings -screws probably somewhere around M10 (not certain on the size though). I saw something similar to this a while back in Germany but I don’t need it in my line of work. Now all I need is a plumber to tell me exactly what bathroom fittings (stud screws) are and how you use this tool. So it looks like it screws in threaded studs…? I could have used one of these for the exhaust manifold studs on my saab last week…..
Double-nutting works very well on threaded studs. Sorry, I just had to, been one of those days. I see my eyes are getting old – 19 not 14. I asked two people from Germany on this subject and they told me this is also common to use for other screws, they didn’t mention bathrooms until I did. So I guess it is like many other tools where it may have originated for use in one area and over time it found its use in other areas. 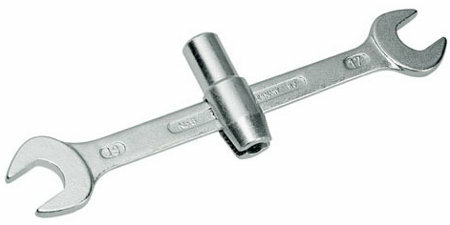 Amazing, a German specialty wrench for European fittings, and very few Americans could figure out what it is by looking at a single picture. What an interesting and practical use of time.